News from Steve Reoch at All Ocean Yachts of a further $550,000 price drop on the 53.3m motor yacht conversion project, Proteus. 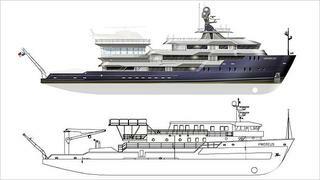 A Sergio Cutolo conversion proposal, she’s an ABS classed research vessel. The six stateroom layout is currently configured with an 85 square metre master suite with panoramic views below an existing ABS classed heli pad. The conversion is designed with a garage to carry a three man Triton submarine plus four jet skis in addition to a 9.1m tender and many more toys. A luxurious cinema and dive center add to the scope of adventure and entertainment choices. Lying in Dania, Florida, Proteus is now down from $2.5 million to $1.95 million.